Home last night after our group pilgrimage which began last Friday. As is often the case with these experiences, we seem to have been living in a very different realm. Friday seems a long time ago and yet the pilgrimage passed so quickly. 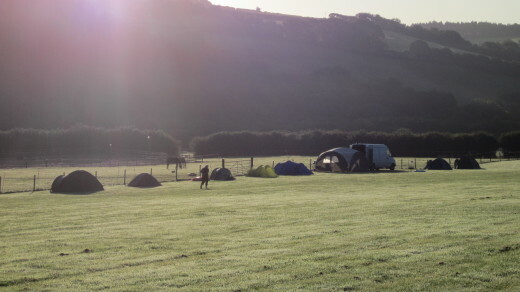 We were forecast some rain on a couple of days but the weather gods were benign, with most of the rain falling at night and although some tents looked a little flimsy they were adequate to the challenge. The days were mostly dry, warm and sunny, ideal walking conditions. A lovely group of people shared the journey, an exploration both of the landscape and sacred sites associated with the Michael and Mary energies through mid Cornwall and an inner journey of reflection and insight. There was a feeling of tremendous support and care for each other within the group, a lot of laughter and some beautiful sometimes moving sharing as well as space for creative expression. The quality of the food and the hospitality we received at our camp sites along the way added to the sense of well being. So now the van is cleaned out, equipment washed and stowed away ready for the next pilgrimage, the last for this year which will take us to Glastonbury, a fitting end point at Michaelmas. There are a few spaces left for anyone considering joining us. Carpe Diem.